It’s natural that beginning students and their parents may have questions, and Ann’s Music World is committed to providing the answers you need. If you don’t see the information you need here, give us a call or use our contact form, and we’ll be happy to help any way we can! The following list includes many of the questions we’ve heard throughout our 29 years, so chances are, you’ll find answers to some of your questions here. How do I decide which instrument to play? While some schools may determine which program is available, you may also have the opportunity to choose whether to play in the orchestra or the band. Often your school’s band or orchestra teacher can provide several recommendations. Sometimes you may want to play what older siblings or parents have played, so we take that into consideration, too. 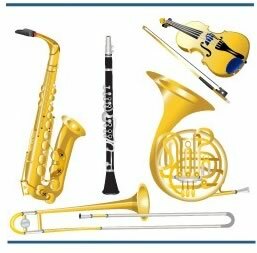 We suggest that you do some research on the different types of instruments, talk with your band or orchestra instructor, and then stop in our store. We’d be happy to share some suggestions with you, too. If I already know how to play one instrument, should I stick with that one or try something different? The answer depends on the student. While jumping from one instrument to the next may inhibit an in-depth experience, broadening one’s musical horizons can also be beneficial. We encourage students to choose an instrument and stick with it long enough to achieve relative mastery before considering a different instrument, but again, each situation is unique. Learning to play an instrument is exciting and fun. Keep in mind that the more time you spend practicing, the more quickly you’ll progress, and soon you’ll be eager to learn new songs. Our private lessons can help you achieve your goals more quickly, with our experienced teachers’ encouragement and support. What if I start and decide I don’t want to continue? We don’t want a music student to give up too quickly, but if you do decide that you’d rather not continue playing your rental instrument, just bring it back. With our rent-to-own contract, there’s no obligation and no penalty for early return, so there’ no reason not to give it a try! We recommend a trial period where beginning students rent the instrument and all of your monthly rental fee applies toward the purchase of an instrument, so you begin making an investment in an instrument right away. At what point will we be required to purchase the instrument? With Ann’s Music World, there’s never an obligation to purchase an instrument. You may rent as long as you like, and all of your rental payment will apply toward the purchase of your instrument. I’ve seen some really good deals to purchase an instrument. Why wouldn’t I do that? The problem with purchasing used instruments from previous owners is that many parents lack the experience and expertise to evaluate the quality of an instrument before purchase. Repair problems could be costly, and there would be no recourse. A high-quality major brand instrument that is clean and in excellent condition. An instrument that meets all of the requirements of the school’s band or orchestra program. A service agreement that minimizes the cost of repair and/or replacement. Experienced, caring professionals who understand the challenges your student may face and who are ready and willing to provide support. If I decide to purchase an instrument, is financing available? Ann’s Music World offers a 12-month, no-interest payment plan with approved credit for the purchase of any instrument. For your convenience we provide automatic withdrawal from your checking or debit/credit card account, which means you have one less thing to think about each month. What if my student starts playing and decides he wants to quit? How long is my contract? We don’t want a music student to give up too quickly, but if you do decide that you’d rather not continue playing your rental instrument, just bring it back. With our rent-to-own contract, there’s no obligation and no penalty for early return, so there’s no reason for your son or daughter not to give it a try! How can I help my student be successful as he or she begins learning to play an instrument? Parents can help ensure the success of any student by establishing a specific time and place for practicing, and then keeping as close to that schedule as possible. Parents should encourage their student to practice, and then be supportive of their efforts. Remember that private lessons provide an extra advantage to boost your student’s success. What is the value of private lessons? Private instructors provide personalized attention to help students keep up with their peers, and they also challenge students above what may be possible in a group setting. Experts agree and numerous studies have proven that students who learn a musical instrument score higher on tests in all academic areas. Should my student wait until he or she is old enough for the school’s band or orchestra program before learning to play an instrument? While we realize that there are always exceptions, we recommend that students wait until 8 years old to begin music lessons. Many students begin with piano lessons which provide excellent preparation for playing a band or orchestral instrument once eligible for their school’s program. Is there any advantage to starting my student on the piano? Absolutely. Students who begin on the piano learn the notes, as well as basic music theory, rhythm, and the discipline of practicing, which puts them at a significant advantage once they join band or orchestra.